Find here Food Packaging Materials, Manufacturers and Food Packaging Suppliers. 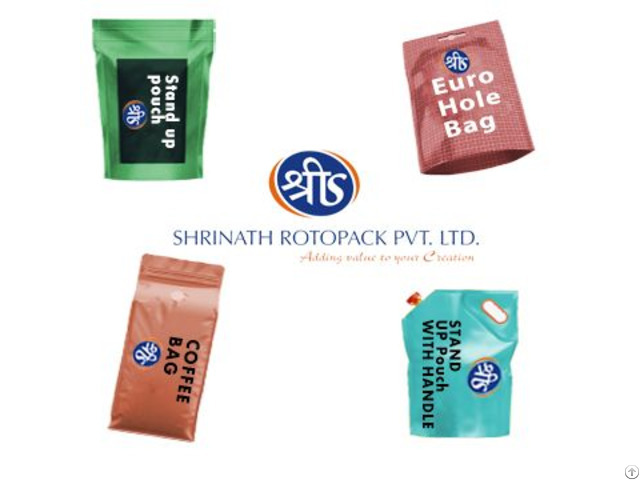 Shrinath Rotopack is India's largest global flexible Packaging company. They Manufacture Bags such as Coffee Bags, Ziplock Bags, Stand up Pouches and Assorted Bags. Shrinath Rotopack Private Limited is the Shree Group’s flagship company based in Hyderabad, India. With an experience of over two decades in the plastic industry and with the growing demand in the Indian market for flexible packaging materials, the group decided to penetrate this market by setting up Shree Laminates in the year 2000. Over the last decade, with several expansions, the entity was changed to Shrinath Rotopack Private Limited in 2007.
Business Description: Find here Food Packaging Materials, Manufacturers and Food Packaging Suppliers. Shrinath Rotopack is India's largest global flexible Packaging company. They Manufacture Bags such as Coffee Bags, Ziplock Bags, Stand up Pouches and Assorted Bags.